Hidden away in foggy, uncharted rain forest valleys in Northern California are the largest and tallest organisms the world has ever sustained -- the coast redwood trees, Sequoia sempervirens. The biggest redwoods are over a thousand years old, rising more than thirty-five stories in what's left of the once-vast ancient redwood forest. Believed to be impossible to ascend, these majestic giants have remained unexplored until recently Š when a tiny group of daring botanists and amateur naturalists discovered a lost, dangerous and hauntingly beautiful world high above California. 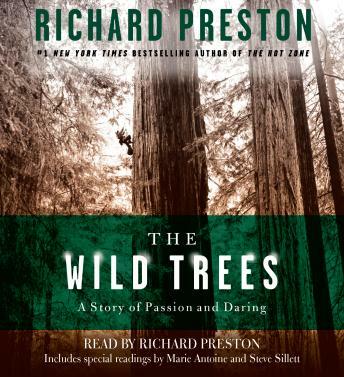 In The Wild Trees, Richard Preston unfolds the spellbinding story of these young voyagers who risk everything to explore the redwood canopy, where the massive trees form flying buttresses and cathedral-like structures in the air. They find a vertical Eden of hanging gardens and rare creatures, an untouched paradise where it's possible to stretch hammocks between tree branches and make love 300 feet in the air. But as they move through the treetops suspended on ropes, far out of sight of the ground, these young adventurers know that the smallest mistake can result in a plunge to one's death.